Isopropyl alcohol is usually the best way to break down ink, however it does depend on the type of ink. 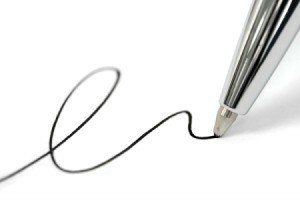 Removing ball point pen from paper can be a very difficult task but it's not impossible. Removing ink from a printed document is very easy using Rain-X windshield protector. Just put a little of Rain-X on a Q-tip, dab on your document, and watch the ink vanish before your eyes. Have a paper underneath for over wetness and just let air dry. How do I remove ball point ink from paper? I work as a professional librarian and do book repair and cleaning on a regular basis. I recommend using a Magic Rub eraser which can be purchased at art supply stores, Office Depot, and Office Max. Office Depot.com has them priced at 89 cents. Don't use the pink pearl erasers, as they will only cause it to smear. What do I use to remove ballpoint writing without damaging the paper? I have seen already a lot of great ideas on how to remove ink. My question is more to do with the colour of the paper? I have a very valuable book, but when bought 18 years ago, my then boyfriend had his name written on it. Before I sell it I would rather remove his name. On another forum I saw results of using bleach on white paper it was fantastic. But I don't want to leave any discolouration to a deep red paper. I have a piece of a old paper that was written on 3 years ago with blue ballpoint pen. How can I remove this ink from the paper without removing the original quality of paper? I received a letter and the person scribbled with ballpoint pen over the address and I need to reply. How do I remove the ink? If you remove the scribbled ink, you're going to be removing the ink below it, too. Maybe the person didn't want you to reply because they scribbled on it? Probably the best thing to do is a thorough Google search about damaged paper restoration on sites that teach how to remove damage from books, etc. or see if you can find a local book restoration in your area. You could also try local stationary stores and see if they have any ideas of how or where. Could you look up the name online in the white pages? They will give you a whole address, but you need to know what town the person lives in.